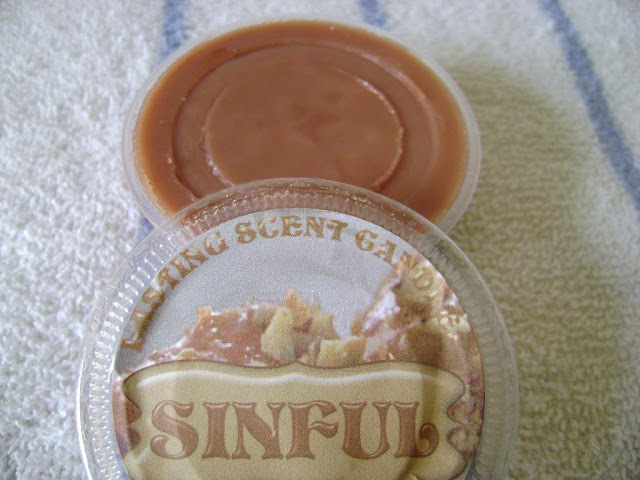 The Redolent Mermaid: Guest Post: Deb Reviews Lasting Scent Candle "Sinful"
Guest Post: Deb Reviews Lasting Scent Candle "Sinful"
This post is a melted review from my dear friend Deb at It's Always Something. I am extremely grateful that she took the time to guest post while I am away on vacation. Her blog is one of my favorites. I highly encourage you to check it out! Sinful- Vanilla custard, French pastry shell, caramelized sugar crust, butterscotch brickle crumble. This scent sounds divine and I'm so glad I was able to try it. Julie was right when she mentioned in her haul post that it smelled like Butter Rum Lifesavers. On cold sniff that is absolutely what I thought of too. Warmed, a bit of the that brickle bitterness I keep encountering came through but it was minimal. Mainly this was a rich and creamy, deep butterscotch scent and I loved it. I wish it had been stronger though. I melted this 1.3 oz. tart in my Glade hot plate warmer and had fairly strong scent early on but it quickly settled down to a light-medium that didn't throw very far past the area of the warmer. I'd like to thank Julie for sharing this wax with me and for letting me guest-post for her while she's away. Deb! Butter Rum Lifesavers! I wish the throw was better for you though. That's kinda a downer.